Avg. Annual Rural Income in 2005: RMB 6230 (up 10.3% over 10.3%). Xiamen (Amoy) is one of China's five Special Economic Zones open to the world. It is a well-known, scenic port city commonly known as the "Garden on the Sea" and the "Glittering Pearl on the Sea". With its unique local culture and beautiful scenery, excellent weather all year round and booming economy, Xiamen has increasingly been attracting the attention of the world. 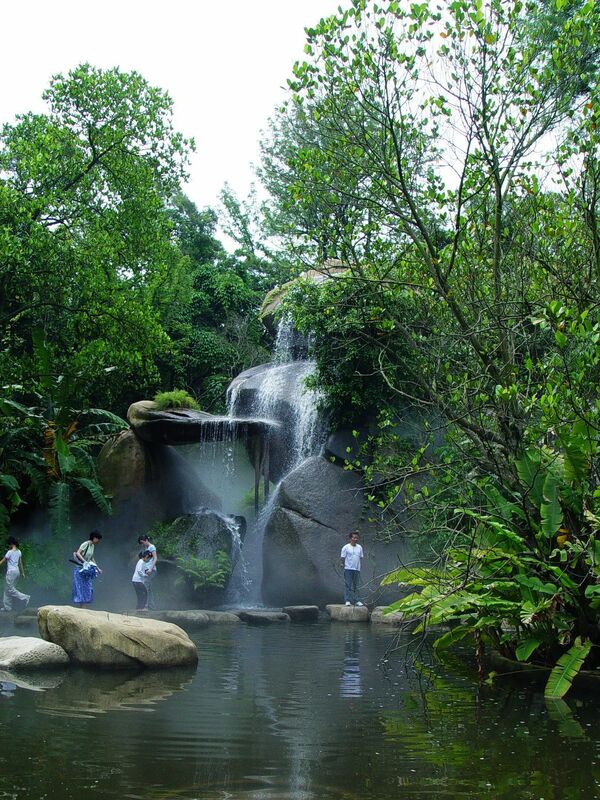 Xiamen has combined the long-standing traditional Minnan culture with modern western culture. Its friendly citizens and delightful environment make Xiamen one of the best cities in the world, whether for working, living or studying. The blend of eastern and western culture you encounter as you wander through the city is of endless fascination. Xiamen enjoys outstanding public facilities, and, in terms of its GDP, is among the leaders of the large and medium-sized cities of China. Xiamen is a port city and a transportation hub, easily accessible by sea, land or air. As well as its highly-developed modern communications facilities, Xiamen has established excellent social security systems, and financial and insurance institutions. It enjoys a fair legal environment and a high level of social order. It is a city, which combines harmoniously material prosperity, cultural diversity, and political progress. In March 2005, it was ranked 9th among 200 Chinese cities for its comprehensive strength. Awards: "The Habitat Scroll of Honour Award", "International Garden City", "National Excellent City for Tourism", "National Model City for Environmental Protection", "National Sanitary City", "National Garden City"
Geographical location: situated at 118.04' East and 24.26' North on the South-east coast of China-in the south-east of Fujian Province, facing Taiwan Island directly across the Taiwan Strait. 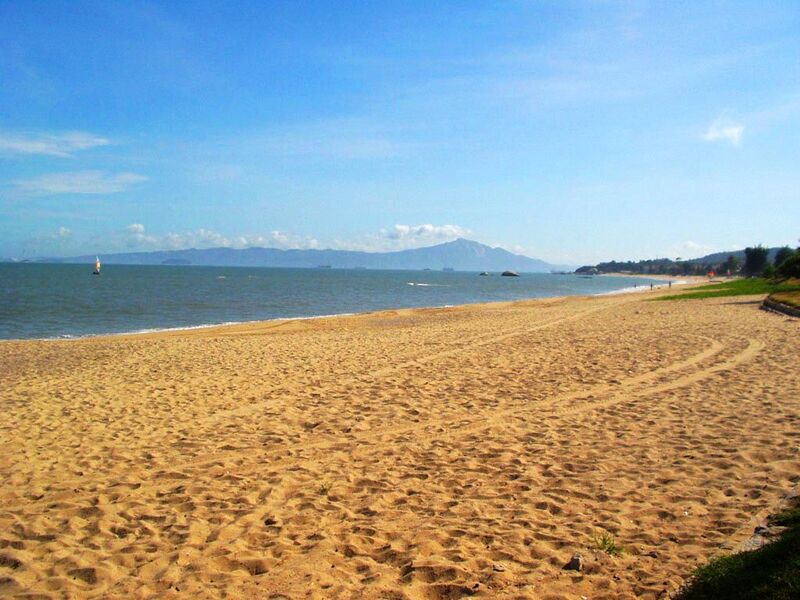 Areas: Xiamen consists of Xiamen Island, Gulangyu Islet, Tong'an and the coastal areas north of the Jiulongjiang River. It has a land area of some 1565 square kilometres, with a sea area of over 300 square kilometres under its jurisdiction. Population: The 2003 census registered the population of Xiamen residents at 1.4176 million, of whom the Han people form the majority, with the rest made up of more than 20 ethnic groups, including the Hui, Manchu, Zhuang, She, Miao, and Gaoshan. Xiamen is also home to a large number of returned Overseas Chinese, family members of Overseas Chinese and compatriots from Hong Kong, Macao and Taiwan. Climate: Xiamen has a subtropical climate, generally mild and rainy, with an average annual temperature of approximately 21℃. Summers are free from extreme heat while winters are not harsh. Language: Xiamen is one of the mainland cities where Mandarin is generally spoken, and in line with its increasingly international status, many people can communicate fluently in English. Main sightseeing attractions: Gulangyu Islet, the Jimei college groups, the Wanshi Botanical Garden, Nanputuo Temple, the Round-the-Island Road (the route of the annual Xiamen International Marathon), and Jinmen-Xiamen sea tours amongst others. Transportation: Xiamen International Airport has direct flights to all major Chinese cities, and to a number of international destinations such as Tokyo, Osaka, Seoul, Kuala Lumpur, Singapore, Manila, Jakarta, Bangkok, Penang and Nagoya. Rail-travel from Xiamen to major cities like Beijing, Shanghai and Xi'an is quite convenient. An expressway network connects Xiamen with surrounding provinces and cities. Public transport on the island itself is fairly efficient. Religions: The main religions in Xiamen include Buddhism, Christianity, both Catholic and Protestant, and Islam. Chinese national law protects the followers' rights to legal religious activities. Xiamen has a number of religious organizations, including the Buddhist Association, the Catholic Administrative Committee, the Islamic Association, and Chinese Christian Church. Nanputuo Temple, the Catholic Church on Gulangyu Islet and the Xiamen Mosque are all popular places for religious activities. Currency: The local currency used in Xiamen is the Renminbi (RMB). Foreign Currency Exchange is available in banks and main hotels, at the Passenger Station of Xiamen Port and at Xiamen International Airport. Shopping: Xiamen is developing into an international city. Department stores and shops offering a wide range of merchandise from all over the world make shopping an enjoyable experience. The main shopping areas include Zhongshan Road, Longtou Road on Gulangyu Islet, Xiahe Road, the Egret Recreation Centre, the airport and Huli tax-free Malls, which sell world-class brand products, furniture, fashions, and jewelry. Supermarkets run by Metro and Wal-Mart and the SM Shopping Mall as well as the many cafes and bars provide the means to an enjoyable life in Xiamen. 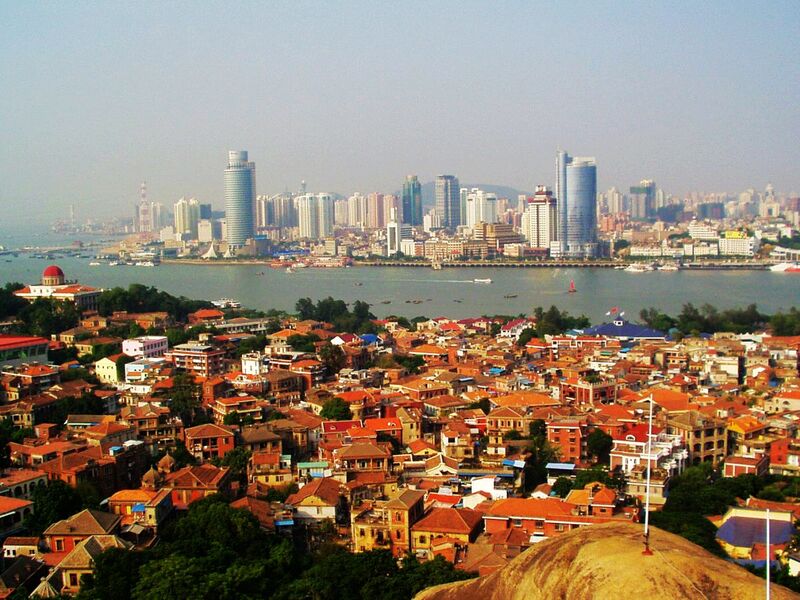 Xiamen is the most prosperous city in south-east Fujian province. Zhangzhou and Quanzhou are neighbour cities to Xiamen. Quanzhou used to be the starting port of the famous "Silk Road on the Sea", and still preserves a multitude of historic sites and a great cultural heritage; its centuries-old marionette theatre is famous around the world. Zhangzhou is known as the "rice bowl" of the province, with its highly developed agriculture. One of the three campuses of Xiamen University is located in Zhangzhou. The well-known "Hakka Round-houses" of west Fujian are only about 3 hours' drive away from Xiamen.